The Villa is located in a quiet cul -de-sac in the village of Macher, with views to the mountains. Large sun terrace with sun loungers to enjoy afternoons in the sun. 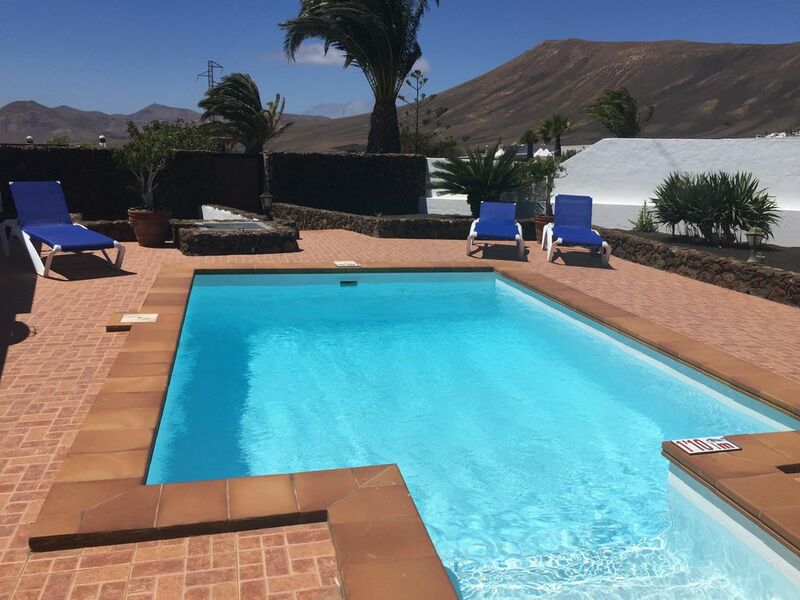 Private heated swimming pool, as well as a built in BBQ area with al fresco dining, where you can enjoy an evening meal whilst watching the sunset over the mountains. It comprises of a large kitchen with dining area, 2 large twin bedrooms as well as a double bedroom with a large wardrobe, and an ensuite bathroom with walk in shower & hairdryer. The other 2 separate bedrooms have twin beds and there is a second bathroom with a walk in shower & hairdryer. A comfortable lounge area with free WIFI and satelilte TV, which looks out onto the terrace and pool area. Free WIFI, free safety deposit box, iron/ironing board/hairdyer/washing machine/dishwasher/microwave/oven/toaster/kettle/ coffee machine. Everything you need to enjoy a relaxing holiday. Within easy reach of the local bus (less than a minute walk from the villa) and also the nearest restaurant. An ideal location, to enjoy a fantastic holiday. I have lived in Lanzarote for over 25 years and have lived in Macher for the majority of that time. Macher is where I live and this is a fantastic location for a relaxing holiday and has all the facilities of a home from home. It is near the resort of Puerto del Carmen and is a great base to visit the island. Antonio and I look after the villa as if it was our own home, and ensure that everything is kept to a high standard. The most recent refurbishments were made in July 2017. Fantastic views and sunsets: Its great to sit out on the terrace in the evening and enjoy the peaceful surroundings whilst having a BBQ. Bedroom 1 with en suite bathroom. (walk in shower) Bathroom has hairdryer Separate bathroom just off the hall, with the same facilities. Towels are changed midweek . Spacious kitchen with all the essential items required, even a dishwasher. This is due to the steps at the front of the villa. Heated pool Highchair and cot are available at no extra charge. Cleaning / Towels / Linen / Maid service: Towels and linen are provided. Towels are changed midweek and linen once a week. Das Haus ist wie beschrieben und sehr sehr sauber. Handtuchwechsel alle 2-3 Tage. Die Besitzerin erfüllt Wünsche sofort. Beispiel: Die Waschmaschine funtionierte nicht, am nächsten Tag war eine Ersatzmaschine da, was uns in der Küche fehlte wurde sofort besorgt. Das einzige was wir nicht gut fanden war, dass auf den Fotos in der Annonce nicht erkennbar war dass der Nachbar den Aussenbereich des Hauses einsehen kann. Less than a 5 minute drive to the main resort of Puerto del Carmen(4,5km). There is a local bus service to the resort of Puerto del Carmen. The nearest supermarket is 2km from the villa. Check in from 2pm. Check out at midday.